Robert W. Culpepper, Dade Co., FL, White, 22 Oct 1950 - 09 Sep 1973. Stephen Thomas Culpepper, Cert 61501, Dade Co., FL, White, 03 Jan 1953 - 02 Jul 1983. Joseph Seaborn Culpepper, Dade Co., FL, White, Male, died Dec 1966. Edith B. Culpepper, d. 2 Nov 1980 at 64 years in DeKalb Co., GA; Res. in Crisp Co., GA, 034174. E-mail written 2007-2012 to Warren Culpepper from David Benjamin Culpepper II (#10872), Jupiter, Florida, e-mail address (Jan 2012). Joseph David Culpepper and Kristi Leigh Beale are the parents of Ashleigh Jordan Culpepper, Female, born __ 1992 in Jackson Co., NC. E-mail written Jan 1999 to Lew Griffin from Charles Carl 'Charlie' Culpepper (#6888), e-mail address (2010). Clarke County (MS) Chancery Clerk, compiler, Clarke Co., MS Births, 1912-1919, Bennie W. White, 2008. 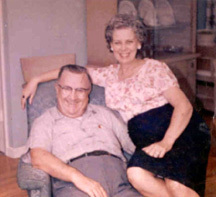 Lois Luvenia Culpepper, White, was born 18 Dec 1917 in Clarke Co., MS.
+ Baby Lois Culpepper, 18 Dec 1917 - 27 Jun 1919. Annie May Culpepper, White, was born 30 Jul 1919 in Clarke Co., MS.
Lamar Culpepper, Son, M, Wh, 6, sng, MS/MS/AL. Lola Culpepper, Dau, F, Wh, 11/12, sng, MS/MS/MS. + C. H. Culpepper, 18 Jun 1921 - 26 May 1979 "Beloved husband, At rest with the Lord"
+ Velma Culpepper, 16 Aug 1921 - (blank - presumed living Jan 99). Louis Johler, Son 27, MO/MO/IL, Vegetable Huckster. Margaret Culpepper, Granddaughter, 9, MO/US/MO. 1840 Census 1 Jun 1840� Ephraim was probably a free white male, age 10 and under 15, in Peter O'Kelly Culpepper's household, on the 1840 Census on 1 Jun 1840 at Saint Bride's Parish, Norfolk Co., Virginia. Biography* � Howell was a carpenter in 1870. In the late 1800's, he migrated from Joplin, MO, to Valley County, Idaho, where he died. More information on his ancestry can be found in "The Boydston Family" by Gladys Boydston Domonoke, 1979. H. T. Boydstun, merchant and postmaster of this place, died Dec. 21st after an illness of a week's duration. The funeral was held in the M.E. church by Rev. Long. Born in Knox County, Illinois June 14, 1834, died at Roseberry, Idaho Dec. 21, 1904. Deceased had a cold which developed into pneumonia. His son, William Bartlett, and daughter, Amy, were with him. H.T. lived in his birthplace until he left for Texas as a man. He was employed by the Federal Government as a conductor of Teamsters during the Civil War. After the war, he was a scout against the Indians in Texas. From Texas, he moved to Missouri, where he contracted and built the first houses in Joplin, Mo. From there, he moved to Illinois, where he lived a year or two at Galesburg. He then went to Crawford County, KS, and farmed about 12 years. In 1891, he came to Idaho, arriving in February and remaining until August when he moved to Long Valley, near Roseberry. He began a mercantile business at Roseberry in 1893 with J. W. Pottenger. Since 1894, he has run the only store in town, and was postmaster 11 years before his death. His wife died 22 Jun 1901, and since then, his daughter, Mrs. William Barker, has kept house for him. He was maried twice, the first time in Texas, from which two daughters survive: Mary, married to E. L. Goul, living at Mesquite, Oregon, and Mattie, married to Thomas J. Knox, living near Weir City, Kansas. He married 13 Oct 1869 to his second wife, Sarah J. Culpepper, in Newton County, MO. Two children resulted, a son, W. B. of Lardo, born 12 Aug 1870 and a daughter Amy married to William Barker and living in Roseberry. The obituary appeared in the Long Valley Advocate, Lardo, Boise Co, ID, Thursday, Decemter 29, 1904. Biography* � Frederick was one of the original settlers of Texas in Stephen F. Austin's colony. He was at the Battle of San Jacinto which set Texas free. He participated in numerous military campaigns, including the Battle of San Antonio, Anahuac, and the Battle of Velasco. Frederick Miller Grimes I, came to Texas from Tennessee with his parents, George and Eurydicy Grimes, in early 1826 as a colonist in Austin's second colony. F.M. is on the List of Colonists, just below his parents and the other members of their family. At this time, F.M. was 22 and claimed land for himself. In 1833 he fought with Capt Simms against the Hueco Indians and was actively involved in the Texas Revolution - Battle of Quintana (Oct 26, 1835); Siege of Bexar (Dec 7 1835); and under Capt R. McNutt and Gipson Kuykendall in the Battle of San Jacinto (April 21). The following year he marries Elmira Susan FARLEY who had come to Texas with her parents, Henry and Nancy FARLEY, in 1831. Her father died before claiming his land, so this portion (Coryell Co) came to Elmira and her sister, Mary, who had remained in Mississippi. F.M. and Elmira began their family in Austin County and then moved to Coryell Co in 1852 being among the first settlers near Fort Gates. Their children married and moved to various parts of Texas. Two of their sons, Thomas and Henry, were tragically killed as young men, in Waco, Tx. in Oct 1869. They had just completed a cattle drive, and were celebrating the coming marriage of Thomas. After leaving the saloon, they rode around the square shooting their pistols into the air. The Reconstruction period Sheriff and men pursued them as they rode up Austin Avenue, and the two were killed. In their later years, F.M. 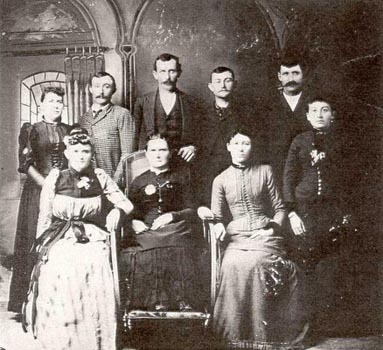 (1882) and Elmira moved to Blooming Grove, Navarro County, to live near their sons, Sam and F.M. II. They are buried in White Church Cemetery, Blooming Grove, (Navarro Co.) Texas. Folks interested in this line should contact Virginia Crilley, at e-mail address. E-mail written 1999 to Lew Griffin from Bob Mann, e-mail address. Theresa Lynn Culpepper, Female, born __ 1987 in Travis Co., Texas, child of Richard Allen Culpepper and Terri Athena Taylor.